Clothes bring out the best in you. What you are wearing, how you are wearing it and the way you are carrying it can create quite an impression on the people around you. Whether you are going for an interview or meeting potential investors or clients, a business suit can help in enhancing your brand. If you are shopping for a suit required for regular wear, choose a versatile colour that can be mixed and matched with any shades of shirts and accessories. Often people buy either a charcoal grey or black colour suit. Though these colours look great, they might not suit for every occasion and can be boring at times. Rather than these, choose a navy suit which is versatile and practical and can be worn in any season, parties or at work. There is a wide range of blue tones to choose from; bright blues to lighter hues and of course navy blue. A navy suit is very popular and widely chosen colour in men’s suits. A navy suit can be worn on any occasion and anywhere around. It satisfies the trickiest dress code and looks appealing from cocktail attire to the formal end of things. A navy suit is easy to dress up or down that will ultimately fit your needs. It can be worn over a t-shirt and white sneakers which give a perfect dress down summer look or with a white shirt and striped tie could be the best outfit for a job interview. A navy suit offers tremendous benefits of matching with any colour. There are endless options of shirt and tie colours and whether it is brown or black shoes or belt, everything looks great. 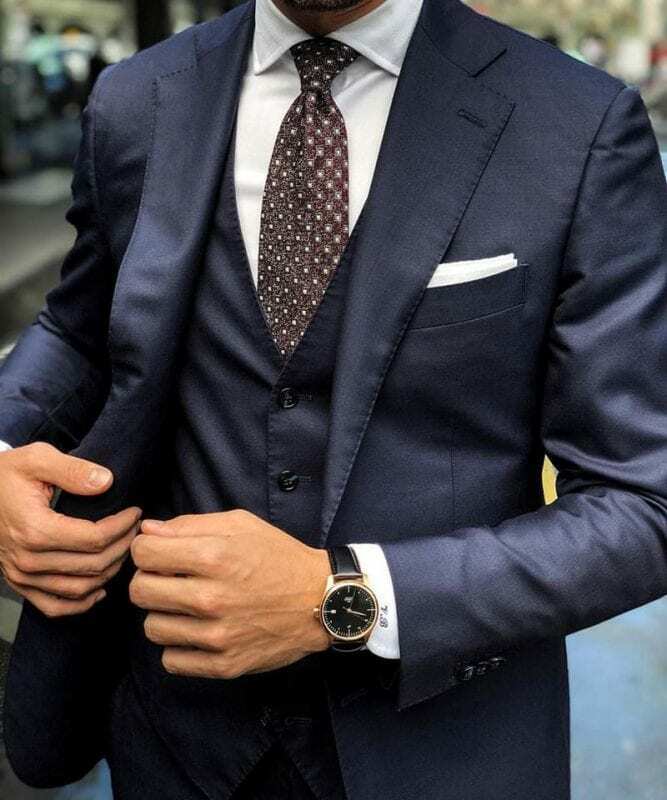 It is a great option to wear a navy suit with a black shirt for an evening cocktail party or any formal event. At the same time, a combination of a navy suit with black shirt and tie looks classier and elegant as well. Usually, people think about whether to wear black or brown shoes with a navy suit. The answer is very simple, anything goes! Typically if you wear a dark shirt then navy suit with black shoes and the lighter the colour of shirt the lighter the shoe. However in saying that it’s not uncommon to switch this up. When it comes to versatility, the idea of a navy suit explodes in mind. The navy suit in menswear is considered as timeless and classic than any other colour. It goes with each and every colour shirts or ties whether it is pink, red, yellow etc. A navy suit throws endless opportunities in terms of putting it on. It is considered as respectable attire in the wardrobe of men’s wear. If you are looking to invest in a navy suit in Melbourne, we, at Briggins have just the right suit for you. We provide convenience, quality and customer-focused experience. Call us at 03 8821 4168 or drop by and find the best options for navy suits in Melbourne. This entry was posted in Blog and tagged Custom Made Suits, Navy Suit, Navy Suit Melbourne, Navy Suit with Black Shirt.